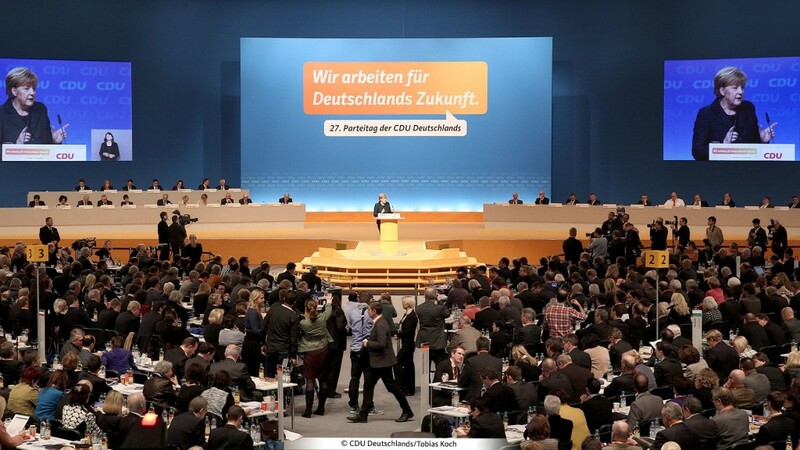 Since 2011 we work for the federal headquarters of the CDU. In 2012, for the 25th Party Convention in Leipzig, we were in charge of stage design for the first time; in 2014, after an open pitch, we again received the commission. 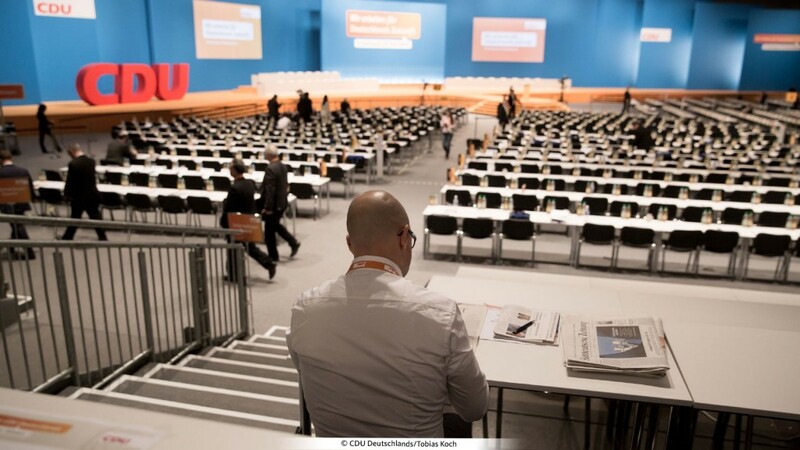 The 27th Federal Party Convention in Cologne brought with it the challenge that it was no longer a “simple stage design” that was required, but rather the creation of a larger, spatially overarching communicative concept. In 2012, for the 25th Party Convention in Leipzig, we were in charge of stage design for the first time; in 2014, after an open pitch, we again received the commission. 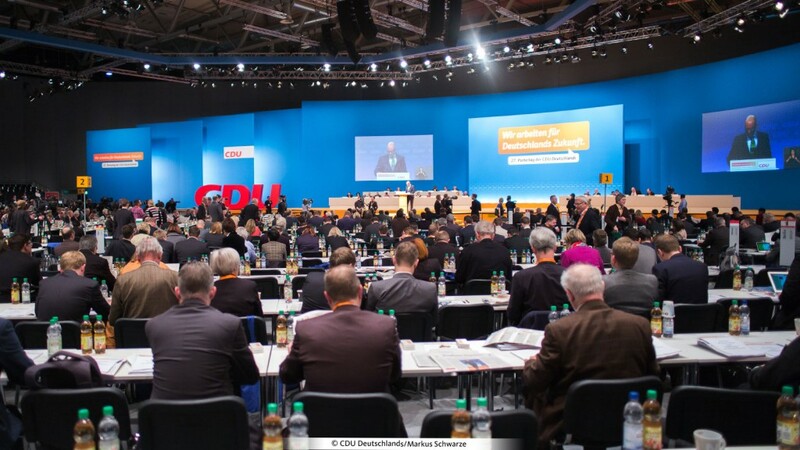 The 27th Federal Party Convention in Cologne brought with it the challenge that it was no longer a “simple stage design” that was required, but rather the creation of a larger, spatially overarching communicative concept. Why? 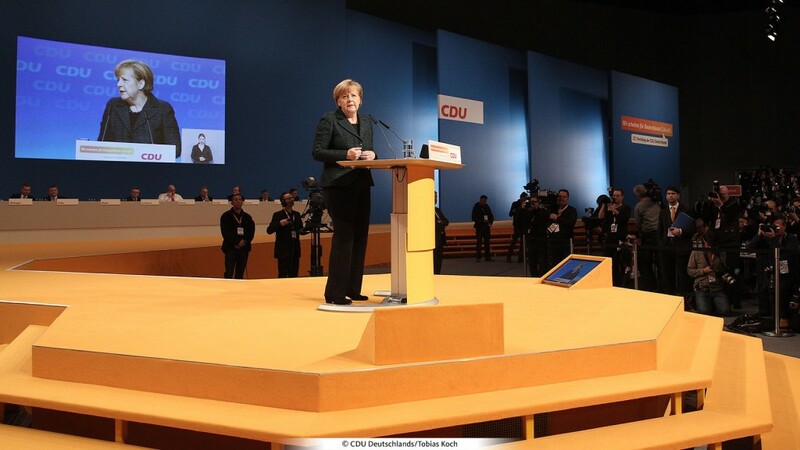 For the first time, the Cologne event was to put the focus on the reform program “Meine CDU 2017” (My CDU 2017), with a particular emphasis on the process of dialogue. This required a new structure, with spaces functioning as centers of communication, promoting exchange, placing people at the center of focus and thus documenting the interconnectedness between party delegates, institutional bodies and leadership. It was therefore necessary to develop a new standard for the design of event, space and communication framework. 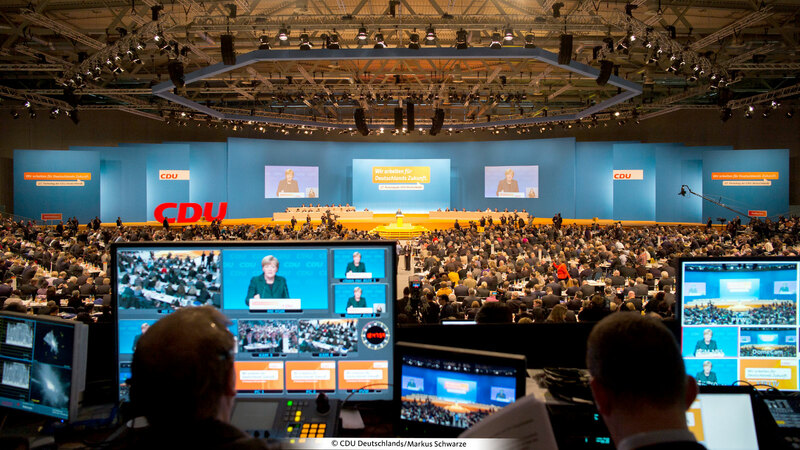 Since 2011, we have been working for the federal headquarters of the CDU, establishing ourselves in the process as the strategic partner for event marketing in the area of political communication. Today, this cooperation extends from election campaigns for seats in the German Bundestag and the European Parliament to various event formats and the Federal Party Convention – with its trendsetting decisions, exciting debates or elections of Party chairpersons. This required a new structure, with spaces functioning as centers of communication, promoting exchange, placing people at the center of focus and thus documenting the interconnectedness between party delegates, institutional bodies and leadership. It was therefore necessary to develop a new standard for the design of event, space and communication framework. The essential idea behind this concept: We transformed the trade fair halls at Koelnmesse, the exhibition center in Cologne, into eight experience-driven spaces that were based on the architectural shape of an octagon. The octagon’s four axes of symmetry represented the traditional values of completeness, accomplishment, perfection and infinity. We made use of this symmetry and shaped our design according to modern aesthetics and dynamics. The result was an appealing communication platform that fostered connections and offered orientation. It also gave way to a VA logo, which was integrated both and all advertising and communications measures as well as in the management and orientation system we developed. The party headquarters of the CDU also participated in this modification by using the design for their trade fair stand. In summary, our areas of responsibility ranged from creation, strategic consulting, project management and coordination of all subcontractors, from the implementation planning level to production, quality management and event direction. The road from here now leads to the 28th Party Congress in Karlsruhe. We’re looking forward to it.